Middle School Vocabulary Prep is a high-quality app that will accomplish the task of increasing students’ vocabulary. The app is simple: a flashcard learning mode, two different quiz modes, and a test mode allow a range of responses and accommodate different learning styles. The learning mode presents words randomly, giving the word, definition, and the part of speech. One minor concern is that the standardized learning page, the format says ____ (the given word) is a _____ (part of speech) and means ______ (definition). This is a bit troublesome because the part of speech sometimes ends up being somewhat ungrammatical, saying things like “abysmal is a adjective.” It would be easily solved by simply rephrasing the section to read “…is a/an ____.” It would set a better example for students and make the app look more professional. The other, larger quality concern is that there is no way to exit the quizzes or test without finishing. There should be a “home” or “menu” button added to each page so users can exit early if needed. This app is well-designed for high school students who want to practice vocabulary on their own. Students can review random words, then take quizzes that give words and ask for meanings or that give meanings and ask for matching words. The larger test option can be used to see overall progress with vocabulary in general. Teachers and parents should be aware that the words covered in the “Learn the Vocabulary” option may or may not be included in the quizzes and tests taken immediately after practicing with the “Learn” section. The app is definitely designed for multiple session practice. 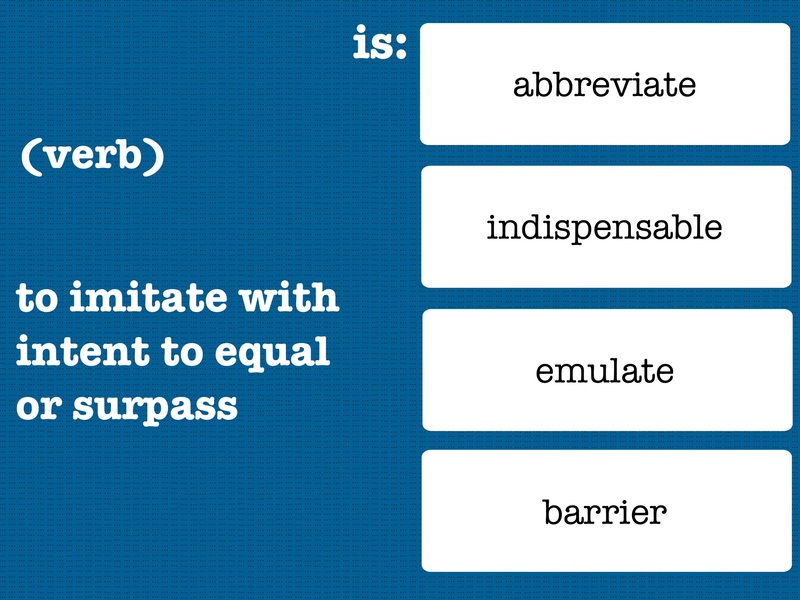 The included vocabulary is perfect for standardized test practice. The words presented are generally at the middle school and high school grade levels and range from common words such as mimic and illusion to the more unusual ones such as decamp, egregious, and dendroid. The email feature would allow teachers to assign use of the app as homework and to later grade the student’s efforts because the progress emails list the words included in the test and the student’s success with them. The app has an optional upgrade for teachers (available as an in-app purchase for $2.99) that offers the ability to assign specific words, to add individualized student records, and to adjust the size and content of the quizzes and tests. The upgrade would make the system much more effective for classroom use. This app isn’t intended to be entertaining, but it does include a few aspects that will make it more pleasant to use. There is soft background music (classical piano) that plays or can be optionally turned off. Many studies show that having unobtrusive music playing in the background during study sessions helps some students learn and retain information more effectively. The screens are clear and colorful, and the app is easy to use. Developers could increase the app’s appeal to teens by adding some sort of points or scoring system that would allow users to work to improve personal bests in a more obvious manner. However, the “past results” section does include dates, scores, words missed and elapsed times for previous trials on the test, so this information is available, just not obvious. Middle School Vocabulary Prep is a great value. For the $2.99 price tag, users will get a comprehensive vocabulary practice app that covers many of the words students need to be successful in upper grades and with standardized tests. The optional teacher upgrade will enhance the app for classroom use and provide a fairly comprehensive vocabulary practice system that can be monitored and individualized for as many students as desired for just under a total of $6.00. This app has unprotected email, an in-app purchase, links to the App Store and ratings pop-ups, and so is most appropriate for students in middle or high school. If parents or teachers have concern about access to email or the App Store, it would be important to disable the internet connection in the device’s settings or monitor student usage carefully.